While families struggle to help students with tuition — and as student loan debt skyrockets — California universities continue to amass multimillion- and even billion-dollar endowments. 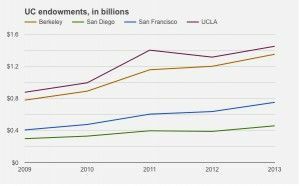 Endowments at the state university system schools have seen massive increases since 2009, even as in-state tuition at University of California has doubled in the last decade to $12,192 and the average student loan balance tops out in California at $20,340 per student as of 2013. 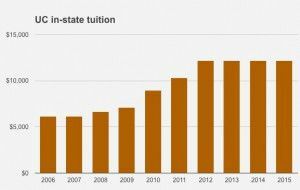 Most universities point to dwindling state support as justification for tuition hikes. But most also ignore, or fail to mention, the increases in their endowments, a considerable pot of money that for some colleges boosts their assets into the billions of dollars. “We need to be forcing these institutions to spend more of that money in financial aid,” said José Luis Santos, vice president of higher education policy and practice at the Higher Education Trust, a Washington, D.C.-based group that advocates for better higher education opportunities for students. The University of California at Berkeley’s nonprofit endowment arm reported a fund balance of $1.3 billion at the end of fiscal year 2013, the last year for which numbers are available. That figure represents a 73 percent increase over the school’s endowment balance of $779.7 million in 2009. The fund supports “academic research for the students, employees and faculty of the University of California Berkeley,” according to the fund’s tax form 990. The endowment for the University of California at San Diego grew 53 percent from $299.8 million in 2009 to $460 million in 2013. At UCLA, the endowment balance increased 65 percent over the four-year period. UC San Francisco’s fund topped them all in terms of growth, ballooning 84 percent. Over the same four-year period, UC in-state tuition increased 71 percent. Endowments are used as investment resources, but the spending of the yield is dictated by fund policy, which can vary. Donors can, and often do, specify use as well, such as attracting professors with certain specialties or for particular research. Santos disputes the claims of colleges who say they are hamstrung by contingencies and conditions on many endowment donations. They also contend that they cannot spend more than a specified percentage of their endowment, saving much of it for investment and future growth. Even a small increase in spending can be significant, though, given the size of the endowment funds. The four schools CalWatchdog examined had a combined fund balance of $4 billion at the end of the 2013 fiscal year. One-tenth of one percent of that balance is enough money to cover full tuition for 329 students. Meanwhile, the salaries of administrators and top educators and researchers have skyrocketed, a fact that has not gone unnoticed by California lawmakers. Assembly Bill 837 would cap UC system salaries at the half-million-dollar mark. 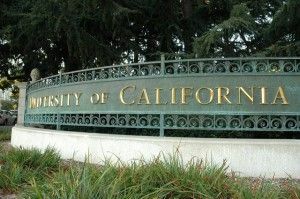 According to the author, “the UC’s stance on increasing student tuition while at the same time continuing to pay its staff over half a million dollars is disturbing. In 2013 calendar year, 387 employees made over $500,000 in total annual salary, with 29 others earning more than $1,000,000 per year. In contrast, the remainder of the 268,442 UC employees earns an average annual wage of $43,520. According to AFSCME, the total UC spending increased by 40% during the 2007-2013 timeframe, while spending on UC’s richest employees increased by 270% during the same timeframe. When UC trustees voted 14-7 to increase tuition last fall, UC President Janet Napolitano said the rate hike was needed. According to Napolitano, UC needs that 4% plus up to 5% more tuition each year for five years, or its equivalent from the state, to afford higher payroll and retirement costs, hire more faculty and enroll 5,000 more California undergraduates over five years. A third of the tuition money will go toward financial aid. According to figures in a March bond issuance filing, the state has increased funding to UC by 31 percent since 2011-12, from more than $2.2 billion to more than $2.9 billion in the 2014-15 budget. The new budget would increase the UC budget by 4 percent, contingent on no tuition increase. UC is the state’s junior university system with 10 schools compared to California State University’s 23. But it has for years endured criticism for its generous payroll. Both systems are regulated in terms of payroll by the state assembly, which occasionally enlists measures to prevent outlandish pay. The measures, though, have not always been successful. In the 2009-10 session, Gov. Arnold Schwarzenegger vetoed a measure that would have prevented executives in the UC system from getting a raise in years when the system’s budget was either kept the same or cut. A measure last session would have required the California State University system to freeze undergraduate tuition and fees through 2016-17. But according to the bill, which also inserted language to “request” the UC system do the same, the freeze was contingent on increases in state general fund support.